Try this Sun-Dried Tomato Polenta Cake for a truly extraordinary side dish. 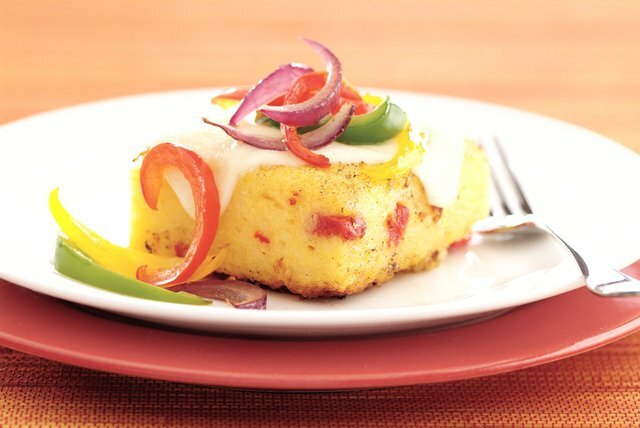 This Sun-Dried Tomato Polenta Cake is topped with melty mozzarella and peppers. Combine water, cornmeal and salt in heavy saucepan. Cook on low heat 30 min. or until mixture thickens and pulls away from side of pan, stirring frequently. Add Parmesan cheese, tomatoes and 1/4 cup butter; mix well. Spoon into greased 13x9-inch baking pan; smooth top. Cool to room temperature. Cover. Refrigerate at least 2 hours or up to 3 days until firm. Cook and stir peppers and onions in 1 Tbsp. of the oil in large skillet on medium heat until tender. Stir in fennel; set aside. Cut polenta into 12 squares. Melt remaining 1 Tbsp. oil and 1 Tbsp. butter in large skillet. Add polenta squares; cook until bottoms of squares are lightly browned; turn over. Top each with 1 cheese slice; cover. Continue cooking until bottoms are lightly browned and cheese is melted. Serve topped with the pepper mixture. Mix water and cornmeal in 3-qt. microwaveable bowl. Microwave on HIGH 8 min. ; stir. Microwave an additional 8 min. or until mixture thickens and pulls away from side of bowl, stirring every 2 min. Continue as directed. Polenta squares can be grilled on medium heat for a great summertime taste sensation. Omit the 1 Tbsp. butter and brush both sides of polenta squares with oil before grilling. Makes 12 servings, one topped polenta square each.